This model FD11-SM13 Campagnolo front derailleur appeared in the 1999 and 2000 catalogs. It has a chrome plated aluminum pivot arm with MIRAGE-T in raised letters. It's designed for use with triple chainrings. Rated at 22T maximum chainring difference and 52T maximum chainring size. It works well with a Campy Comp Triple 50-40-30T crankset running an SRAM 6-7-8 speed chain. Besides the unique chrome plated pivot arm it looks about the same as most of the other triple capacity Campy front derailleurs from that era. 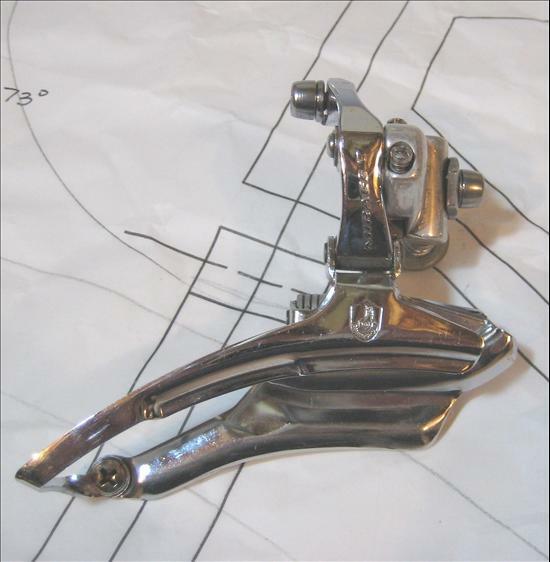 I have a matching the MIRAGE Triple medium arm rear derailleur with the same kind of chrome plated parallelogram listed under RDs. Details: Mirage really falls below the level of what one would consider a Road Race worthy groupset, but it is still designed for road bikes.